It’s about time to solve this power problem on music gear once and for all. Here’s the thing: USB has quietly simplified powering everything else. Look at your phone. Now, a USB cable not only means you can charge from your laptop, but also various travel adapters – and, crucially, from battery power. With mobile batteries getting steadily better, that’s huge. You can just pack a battery and not worry about finding a wall socket, for hours or (with high capacities) even days. And those batteries are getting better as products, too – you can buy some nice looking, nicely functioning mobile batteries for not a whole lot of money. 1. A lot of synths do provide battery power, but eat through AA batteries – like the KORG volca series, for instance. That’s expensive, and then you’re out of luck if you don’t have batteries handy and they die. 2. A lot of other gear you might want to use on batteries don’t provide battery compartments. 3. You can easily wind up with mismatched power supplies for equipment – and then you’re in big trouble on the road. In fact, that’s increasingly true I find of even USB accessory gear. I’ll have the power supply I need, but not the right tip adapter. It’s got various tips and voltages for different products. (Yep, it works with our MeeBlip line, for instance – meaning you can power the MeeBlip from a long-life USB battery pack. It has voltage variations (5-18V) plus 1000mA amperage for compatibility with quite a lot of stuff. The industrial design is rather clever: various features to improve durability (I’ve certainly destroyed USB cables so that’s nice), plus braided cable design and a pull strap to avoid tangling. For addicts of the KORG volca series like me, it’s a godsend. 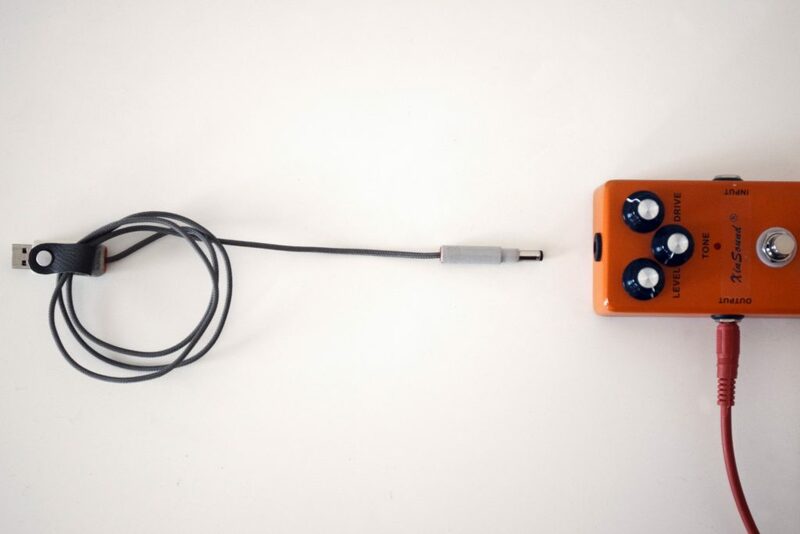 With a special cable you can connect up to five volcas with just one USB connection (or, say, my mix of volcas and MeeBlip). But it will also work with gear like the Push 2 or Traktor accessories. Another key added bonus – because you can plug into your laptop or battery, you can avoid ground loop problems. That’s obviously a big deal. There’s also an adapter that lets you charge from your phone, which is a bit mental! The Kickstarter project has the bright idea of pairing the cables with complete solutions with batteries and so on – so while those funding levels look pricey initially, they’re actually a decent buy. As I write this, they’re just shy of their goal, so I do hope we can put them over the top, as this looks great. My colleague got one and we’ve been testing this – and it’s just brilliant. Works perfectly. Irish maker myvolts have a whole line of this stuff for various gear – just in case you can’t wait until end of summer for the mass production of the Kickstarter project to ship.